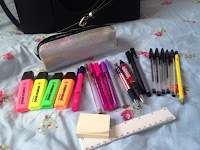 A new school year has started, and for me that means a new bag for me to try and keep organised for a year, and I thought I would share with you how I have organised/what's in my school bag this year. I have never done a normal "What's in my school bag" a lot of the times they have been school trip editions, but this time it is not! I have only actually been in school for a day and a half and I have had no homework so far, so my bag is kind of empty, but I'm going to show you anyway. 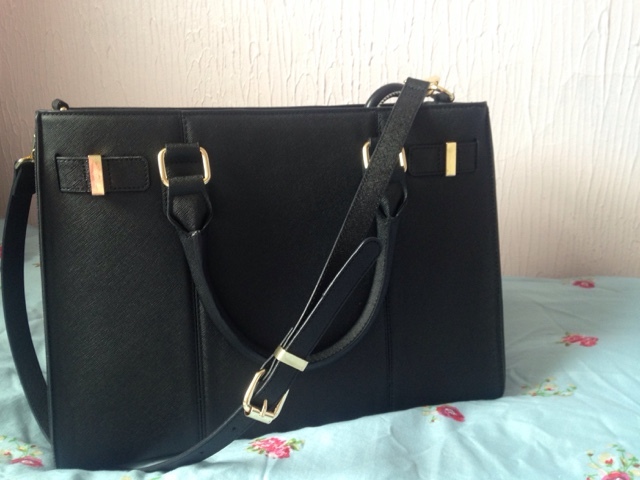 This is my bag, it is from Accessorize and it is the Charlotte Work Bag and it is £39. 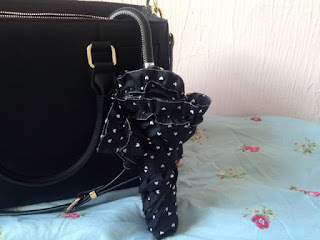 I am in love with this bag, and as soon as I saw it I knew I wanted it. It is kind of big, but not over sized, it has two main compartments, that are open and just close by using a press stud and then it also has a central zipped pocket. It also has a big phone pocket on one side and on the other a small zipped pocket. 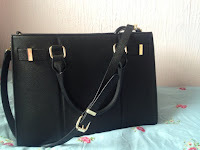 The bag has a detachable shoulder strap, that I keep on and personally I prefer that. Now onto what is in my bag! 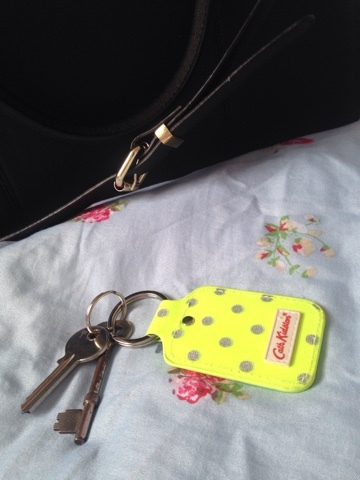 As I mentioned before the bag has a big phone pocket and in there I keep two things. They are, my keys, I love the key ring I have on my keys at the moment, it is from Cath Kidston and my cousin got me it for Christmas, with a matching purse, I love it because it is easy to see it when it is in my bag. 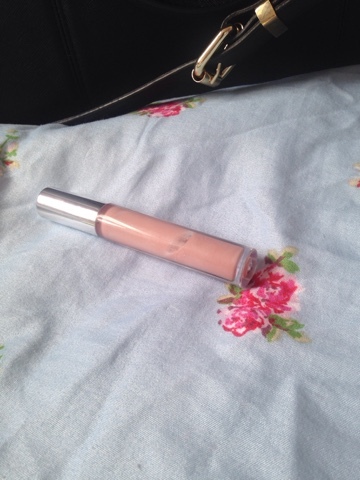 I then also have a lip gloss, it is the Barry M Boss lip gloss in shade 4 Let's touch base, this would normally be in my blazer with my lip balms but I threw it in my bag on Friday. 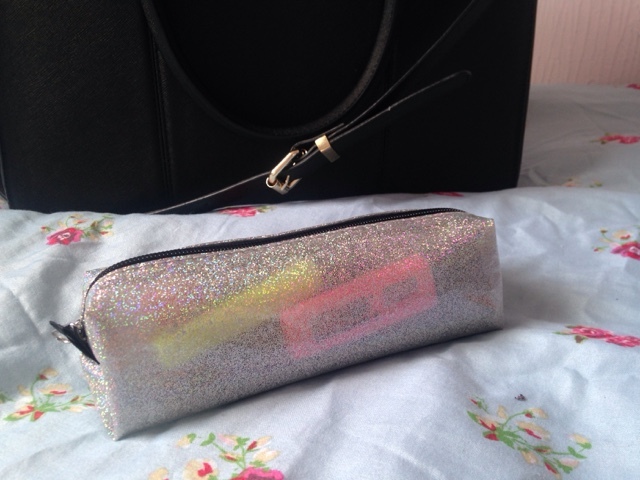 Now onto what is in the first compartment, firstly i have my pencil case. I love my pencil case, I normally don't get a pencil case but I saw it and had to have it. In my pencil case I just keep highlighters, pink and purple pens and a gold one, I have one pencil, one blue pen a ruler, post it notes and a few black pens. If you can't tell I only write in black and as you can see my favourite black pens are the Cristal medium 1.0mm point pens, I love them and have around five in my pencil case and I keep two blazer pocket. 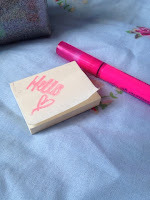 I also love that pink highlighter, it is like a crayon! 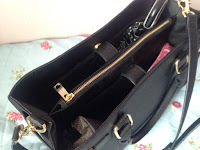 Another thing I keep in the front compartment of the bag is a small full of must haves. 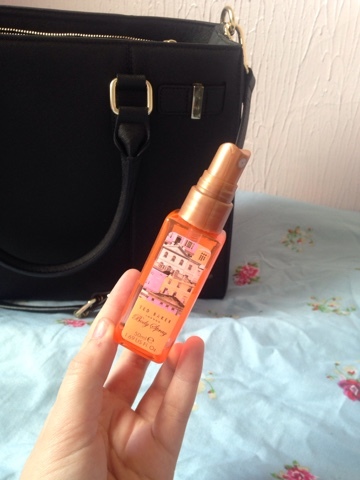 I always have this in a bag, it always is in my "what's in my bag" posts. In the bag I keep, a Nivea Pearly Shine lip balm, my favourite hand sanitizer, it is the Carex complete fun edition one in Strawberry Laces, it is amazing! 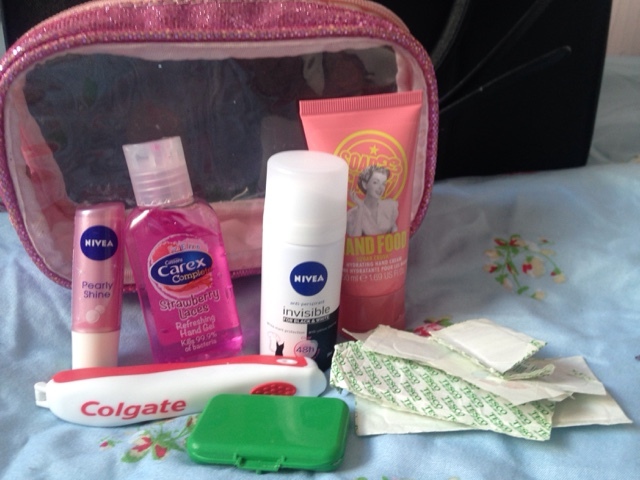 I also keep a Nivea travel size deodorant, what came in handy yesterday after P.E, another thing I keep in there is my Soap&Glory Hand food in Sugar Crush and I don't love it as much as my Hand Dream, Super Cream, in the bag I also have a travel colgate tooth brush, but I have no travel tooth paste, another thing to go with teeth is my brace wax, that I don't actually use that much anymore. 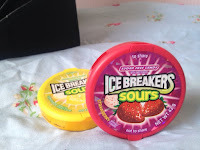 Finally I have a lot of plasters, I have these because one, I don't know if my school actually give out plasters, because I have only ever got one (a blue one) when I cut myself trying to open a tin in food tech, other times I have never got one, I also have really bad blisters because of my school shoes! 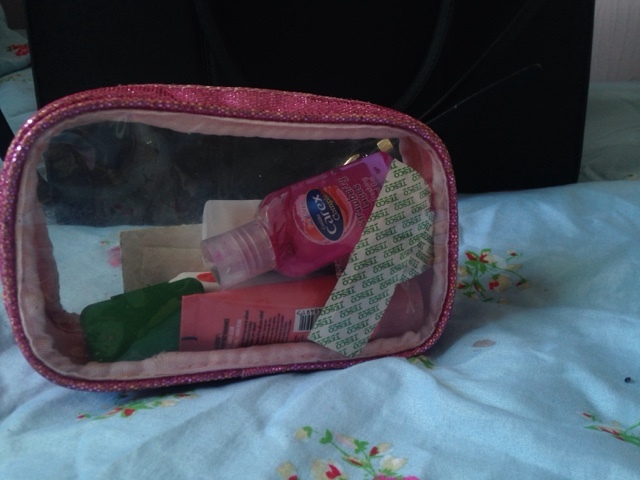 The final things I have in the front compartment are sweets and a spray! 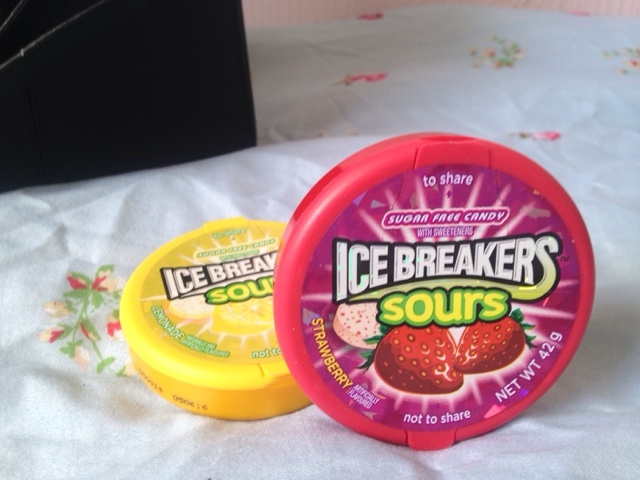 I have Ice Breakers sours in Strawberry and Lemon, because it is always nice to have some sweets in the middle of school. Then the spray is a Ted Baker body spray and I think it is the Beau one, I think it is, the gift box it came in was called the Beau Box. 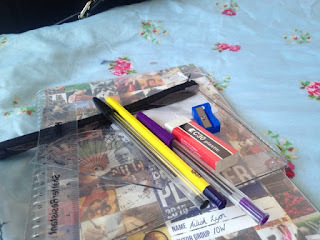 Now onto the middle zip pocket, in there I keep my school planner and pencil case. My school gets the whole school a planner and a pencil case, the planner this year is different to the normal one and is very ugly and bigger. In the pencil case it comes with a ruler, a protractor, a pencil sharpener, a rubber and a pencil, and black pen (that is not the same pen I use) and a purple pen, so we can reply to comments off the teacher in our work. I also keep my portable charger with the lead, I think may start to take my plug as well, just in case the portable charger is dead! 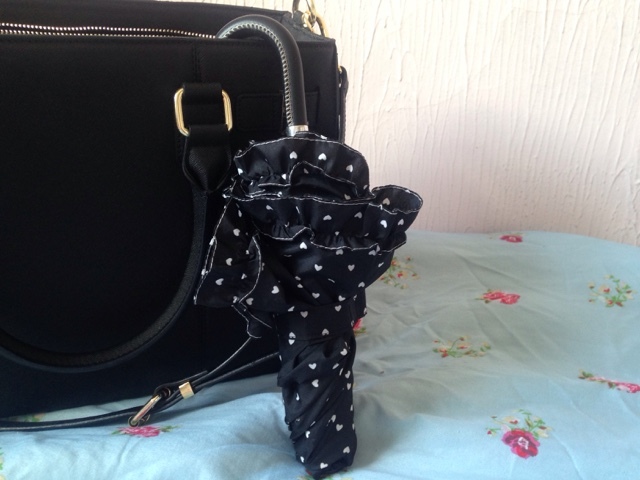 Finally, in the back compartment of my bag I currently just have my umbrella, I also keep my lunch in there, and on a Friday my P.E top and converse, also when I get homework, my books will go in there! 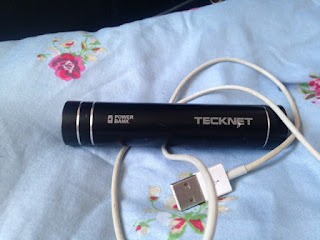 That is what I currently keep in my school bag, it most probably will change a lot! 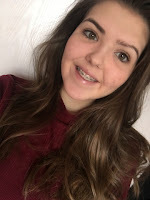 I hope you liked it and comment down below what your essentials for school are and anything about school! Life Booklet are all about the healthy living, simple and inspirational lifestyle, great rumors and celebrity news, yummy and tasty recipes ready to be putted on the table in no time and what your destiny is all about, says the astro section.